This September at our school The Yoga Space classes are inspired by the Yama’s. The Yama’s help us cultivate a relationship with our self, others and the world so that we may flourish. Inspired by the five precepts of Buddhism, the Yama’s instruct us in behaviour to refrain from in order to understand the yogic path. For me, embodying the Yama’s allows us to awaken to and live with love. For Patanjali, who authored the Yoga Sutras, these ethical restraints are the beginning of the path of yoga. It is important to remember that the Yama’s are not commandments or moral imperatives, but rather aspects of living that we might reflect upon in order to evaluate our thoughts, words and behaviour. For many the Yama’s are much harder to practice than asana or meditation! My experience is that how I live the Yama’s has changed and evolved over time. What began as a quite simplistic attempt to live according to these ‘rules’ has now become more of a regular opportunity to ask myself – using the framework of the Yama’s – if I am moving towards or away from love. Ahimsa, the first Yama, is the heart of the yogic path. But how this translates into practice will be different for everybody. Just as asanas take different expressions on different bodies, so too the practice of ahimsa will be lived quite differently for each person. For some of us we need to begin our reflections by examining how we treat other people. We can ask our self if the words we use are kind, if we gossip, and if we make statements about others – would we say it to their face? We can ask ourselves if we are treating the earth in a way which is nurturing? We can reflect upon our own judgements, and toxic thoughts, or attachment to certain stories about situations which make us the victim and others the villain. For others our practice of ahimsa needs to begin within. For those of us who internalise and blame ourselves, think negatively towards ourselves, always lift others up and put ourselves down, or compare ourselves to others and come up short – the practice of ahimsa will look very different. It begins with embodying a gentleness towards our own mind body and heart. Non-harming is embodied in the realm of actions, speech and thought. According to Patanjali, the antidote to harmful thoughts, speech or behaviour is to initiate a movement in the opposite direction. For example if we find that our thoughts have become angry, or spiteful, we should mentally to coax our thoughts in the opposite direction, towards kindness, gratitude and love (Y.S. 2.3). Through approaching our mind states in this way Patanjali believes we will overcome or avoid great grief and mental disturbances (Y.S. 2.6). In order to practice non-harming, the five kleshas are important. The kleshas describe how to become liberated from suffering. To be able to actualise the practice of ‘moving in the opposite’ direction when we have harmful thoughts or find our self engaging in harmful speech or actions we need to understand how we got to the point that we were engaged in these thoughts or behaviours in the first place! Essentially, the reason we might find ourselves internalising and speaking unkindly to ourselves or externalising and blaming others for our problems is because we tell ourselves certain stories throughout our lives which we struggle to let go of. These stories in yogic terms are known as samskaras. They are deep emotional, mental, physical, spiritual grooves which is where our mind goes, when we are not working on practicing ahimsa. I wrote about them here. The practice of ahimsa directly relates to abhinivesa – which some think of as fear of death, but I understand as clinging to life – to the story we tell ourselves about who we are, what we can do and what we deserve. In order to live according to ahimsa, to undertake the practice Patanjali suggests and “move in the opposite direction” away from harm and towards love, we need to work on these deeply ingrained patterns (samskaras). This is where practice comes in: steady, regular practice. Whether it be Ashtanga, Meditation, Bikram or Restorative Yoga. The internal work remains the same – it requires a waking up to the avidya (ignorance) that fuels these stories and seeing clearly. It is not easy to do, and not something we all have the willingness to do. It requires a whole lot of self-responsibility! No one can do this work for you – you need to do it for yourself. But as you begin to become aware of your patterns, your internalising or blaming, at times the fog of self/other harm lifts and you begin to navigate life a little differently. There is no more ‘me and them’, there is less internalising and self-blame. There is a lot more love in our hearts. From my perspective, this requires time. To deeply embody ahimsa is not something that happens straight away. Even if we feel the desire consciously to live according to the principles of non-harming, we all have our blind spots in our own behaviour and consciousness. As we mature in practice we begin to see that practicing ahimsa is a little more complicated than a simple command to follow. Indeed, evaluating the way in which we are, or are not, practicing ahimsa in our life provides fruitful moments if reflection that will inspire our personal growth. 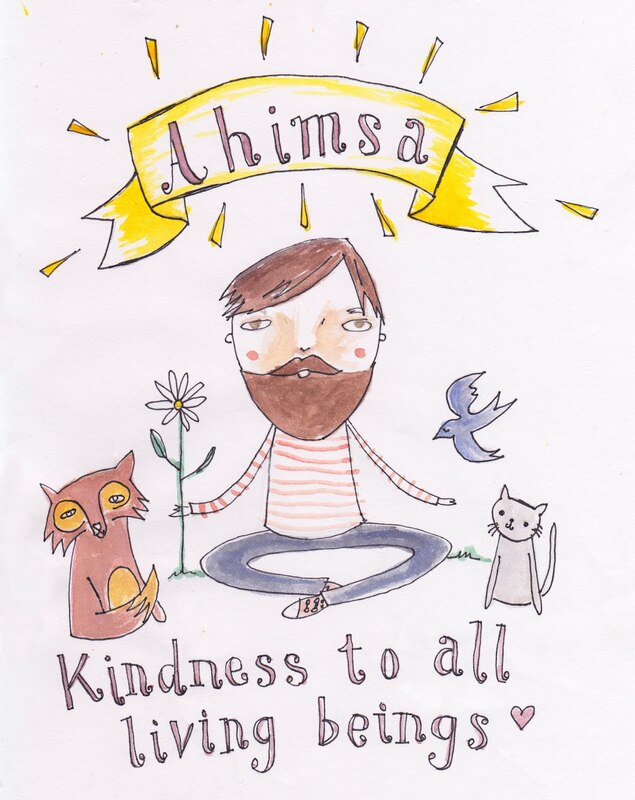 To help with some practical tips we can reflect on ahimsa towards self and others. Perhaps the prompts below might inspire some reflection. Do I give myself permission to rest? Am I gentle with myself if I make a mistake? Do I take responsibility for my decisions or blame others? Do I nurture my mind, body and heart? Do I allow people to treat me unkindly? In what ways do I disrespect myself, my work, my time, my energy? Am I quick to celebrate others, but not myself? Do I feel the need to justify my choices constantly to others? Am I honest and transparent with my family, friends and colleagues? How might I celebrate the joys and successes of others? Do I blame others for my choices? Do I reciprocate the attention and energy others give me or do I mainly take from others? Can I cultivate joy for the success of others? Do I act in ways which lead to deeper relationships? Do I respect people’s boundaries?